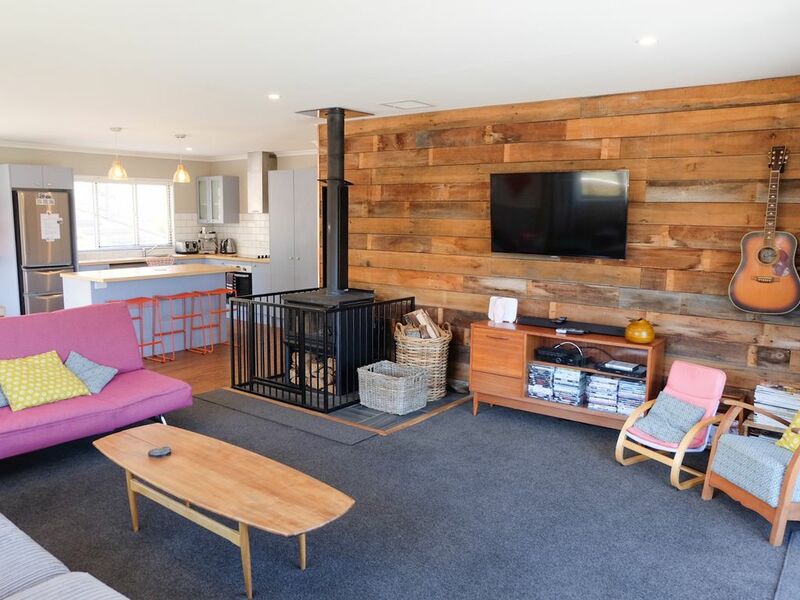 You're invited to relax at our personality packed holiday house in Hanmer Springs. Enjoy everything Hanmer has to offer in this convenient location - only a 10 min flat walk to town or the pools. The house is perfectly set up for 4 or 5 couples, or two families. Built in 2016, the house is super warm with all the mod cons including a large log burner, two heat pumps and espresso machine. Hanmer Time is only a few minutes walk to the golf course, domain and tennis courts if you want to get active, otherwise relax on the raised deck with a cuppa and watch the pedal pushers go by. Don't worry if it's a rainy day - you'll keep warm by the huge woodburner, and there's stacks of DVDs, Sky TV (basic + sports), Chromecast, a PS2, toy box, puzzles and board games to keep you and the family busy. The open plan living/kitchen/dining has large stacker-slider doors that open onto decking areas to the front and rear of the property, providing excellent indoor/outdoor flow. There is also a smaller deck up the garden steps in the fully-fenced rear yard which is perfect for relaxing in the sun, taking in the surrounding views, or enjoying a starry evening. Please note the house has external steps for access. This is a self-clean property, and guests are required to provide sheets, pillow cases and towels. Duvets, pillows, hand towels and tea towels are provided. Pets are currently not allowed, however, the homeowners do have their small dog in the house on occasion (for those who are highly allergic). The house has a lock box code which the combination for will be provided a few days prior to your stay. Guests are then welcome to arrive anytime after checkin and to make themselves at home! When submitting your booking request can you please add a comment about the makeup of your group, reason for your stay etc. I live in Christchurch (90 minutes south of Hanmer Springs) with my wife, Kylie, our son, Freddie, and our wee dog, Pedro. I work as a territory manager while Kylie is a self-employed web developer. We enjoy traveling and getting out and enjoying nature whenever possible. As with many Christchurch folk, we love spending time relaxing and enjoying everything Hanmer Springs has to offer. The combination of fresh alpine air, world-class hot pools, extensive walking and biking tracks, and only a 90 minute drive, make this such a great spot, even for a weekend getaway. So, we decided to buy a section and construct a purpose-built holiday house. The build was finished in July 2016. We love being situated in a quieter area in Hanmer Springs. We benefit from the golf course, domain, tennis/basketball courts and playgrounds being very close by, and the hot pools and village are still only a casual ten minute stroll away. The house was purpose built as a holiday rental in 2016 with four bedrooms and a large, open-plan, kitchen/living/dining area. We have done our best to make this feel as much like a home away from home as possible - with a large log burner, two heat pumps, large LED TV, espresso coffee machine, free WiFi, over 100 DVD movies, a PlayStation, and colourful decor/artwork, we hope you'll feel right at home. As a unique extra there is an additional 20m2 deck at the top of the section up a garden path behind the house. This is a great spot for star-gazing, relaxing on a summer's day, or taking in the surrounding vistas. The Hanmer Springs village is only a short 950m walk from Hanmer Time. This is a nice, flat walk along the edge of the domain and golf course and normally takes about ten minutes. The house, while not directly adjoining the Hanmer Springs Golf Course, is located only 500m from the clubhouse and 150m from the 9th tee. Hanmer Springs is an alpine village and Hanmer Time is nicely situated to take in the views on offer. The house is elevated on poles offering great views over nearby houses. The Hanmer Springs Golf course is only 500m down the road. Two sets of golf clubs and trundlers are provided for guest use (please provide your own balls/tees etc - can be purchased from course). Warm and cosy house perfect for families. This house was perfect for a family get away. Our group consisted mainly of small children and the house was warm, safe and equipped with everything we could need. The owners were very accommodating. Such a wonderful house to stay in! Everything was perfect! Would definitely stay again! We are a family of 5 that includes 3 teenage boys and this home was perfect for us. Located within and easy stroll to the hot pools, shops and restaurants. The air conditioning was essential during our stay as the temperatures were in the 30’s. The whole house has everything you need, and is well equipped for families, including those with small children. We found the place lovely and clean ready for us to get settled. Loads of books, movies and sing star which the kids loved! Can’t wait to return! Great stay at Hanmertime! Excellent accommodation. Would stay again - highly recommended. Well equipped home in great location. Lots of extras not usually found in holiday homes. Hanmer Time is ideally located in a quieter area of Hanmer Springs. This lends itself perfectly to a nice relaxing time away, while still being in close proximity to key activities in the area. Hanmer Time has no adjacent neighbouring properties on any side and the bush on two sides is great for bird life. The golf course, domain, tennis courts and playgrounds are only a few minutes walk away, with the famous Hanmer Springs Hot Pools and village a ten minute stroll down the road.